First posted 21 October, 2010. A strong white overproof, of which not much can be said, since I had an adulterated version: but that “bush” is one of the most evocative, crazy experiences I’ve ever had, and if you brave the Spice Island to get some, more power to you. I have never had a rum like this one, and I know that 99.99% of the people reading this (even if you’re from the Caribbean) haven’t either. No, really. When was the last time you a had a 138 proof rum with what looks suspiciously like a worm floating in it? I know for damn sure I’ve never even seen one like it (and maybe never will again). Now let’s be clear about one thing. 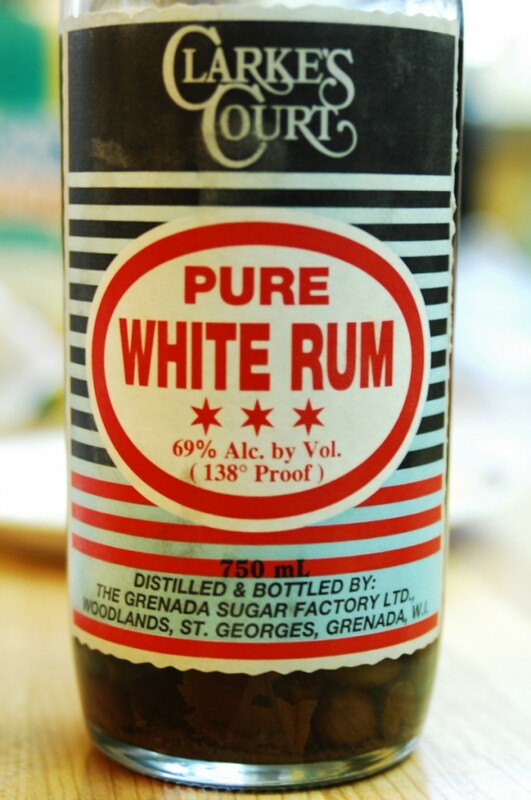 The real Clarke’s is a legitimate overproof white lightning made in Grenada by the Grenada Sugar Factory since 1937, and is apparently the most popular rum on the Spice Island, best had with some Angostura bitters (the 43% darker rums made here are supposedly for the ladies, who “prefer gentler rums”). Local wags claim it’ll add hair to your chest, strip the paint off anything, and can run your car if you don’t have any petrol. Older ladies use it as a rub. The commercial rums of this distillery have actually won several awards for excellence. However, what *I* had was – how do I put it – a refined variant of the standard recipe. In a word, I had the “bush” (and that’s why I’m also not scoring it). How it got into the kitchen of one of my oldest long-distance friends is a question best left unaddressed. Bush of course has a long and honoured tradition in the West Indies. We called it “bashwar” in the jungle camps I used to work in, always had a 45-gallon drum fermenting somepace, and as I noted in the Newfoundland Screech review, backyard variations are a fixture in the remoter areas of The Rock. You take your life in our hands when you drink some of this stuff, I told John, as he poured me a generous shot of a clear purple-brown rum. He grinned and turned the bottle, which no longer had a white rum in it, but a coloured liquid in which floated additional ingredients: leaves, bark, twigs, berries, and, yes, that plump worm. I said a heartfelt prayer that the thing was dead, and knew right away that there was exactly zero point in attempting to review the rum the way I dealt with more commercial wares that actually pass a certification process of some kind. The tasting of some new, as-yet-untasted rum of the cheaper type, no matter how it started life or ended up in my glass, is more an exercise in zen than anything else (hush, ye snickerers). It’s about feeling, about memory, about what it brings into your mind when you taste it (even if you immediately throw up afterwards). It’s about who you are and what brought you to this place. By that criteria, Clarke’s delivered in spades. After waving away the spirit fumes which evidently wanted my wife to collect on the insurance, I got a powerful scent of chemicals, and was transported to my boyhood in a flash. It was the exact scent of the orange lye soap I grew up bathing with at a small stand pipe in the overgrown backyard of a small house we moved to in Georgetown’s Charles Street when I was nine. It was my aunt Sheila cutting up a tableful of fiery hot peppers at four in the morning to make into hot sauce. It was “It’s A Fact” at 645 in the morning on Radio Demerara, black pudd’n’ with plenty sour, a hot curry with roti, a cookup with nuff nuff chili ‘pon it. And the taste, wow: sweet, brandy-like, fiery as all hell, and yet dusty too…old, aged, like a sleepy pre-Independence Georgetown dreaming in the sun under the Union Jack. It was the memory of the dingy beer gardens my brother and I haunted on Broad Street, with bob-pieces given to us by our uncle Ronald to play pool with. It was the smell of too many old pool tables with dead rails and old balls that barely bounced. It was the smell of rum and stale beer and cigarette smoke and guys with no clear occupation playing cards or dominos in these places at ten in the morning while Roger and I shot a rack. It was the deep smell of the old drugstore right down the street, now long gone, with chico sweets in rows of huge glass jars, plastic revolvers with rolls of caps from China, all mixed up with the odours of Limacol, drugs and prescriptions and memories of childhood when life looked sunny and summer holidays went on forever. At 69%, you aren’t getting subtlety on the finish and I won’t pretend you will, or that Clarke’s bush variant even approximates that. But you know, all those herbs and crap in the bottle seem to have smoothened it out somewhat, taken the edge off, because the burn is deep and warm — and still with that elder dusty air wafting around in the back of your throat, like the times of our youth in a small town that you now no longer remember clearly, except in your dreams and fading memories. I sort of likened the Bacardi 151 to a race car and wrote a good humoured review in that vein. Clarke Court’s Pure White Rum (the bush variation) is not like that at all. It’s strong and crazy and unique, and I didn’t think of speed or racing thunder at all when I tasted it — instead, the cars I got were the old taxis of Georgetown: Hillmans, Austins, and Morris Oxfords, with cracked vinyl upholstery and purring engines, and my brother and I jouncing around on a Saturday morning going with our mother to Bourda market to shop for fresh stuff. The rum may be raw, smelly, one-of-a-kind home-adapted hooch , and commercially unavailable in this iteration. But the memories it evokes in this long departed Mudlander are priceless.